It's a shame Vernon Wells never really hit it big, this film showed what a great actor he was. 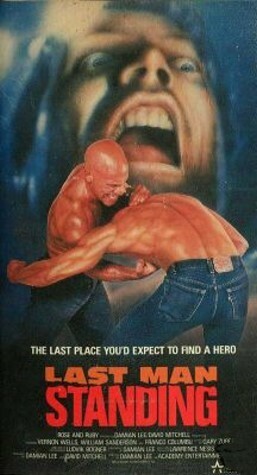 On a side note, the PM film by the same name is one of my all time favorite action films. Totally agree. Vernon Wells always brings his A-game. Loved the Wincott Last Man Standing too. A PM classic. the two dudes on the cover are the shiniest humans, maybe ever. Haha! Just like the Bleeders "Bleeding box", this was clearly a gimmick to attract video store patrons' eyes.